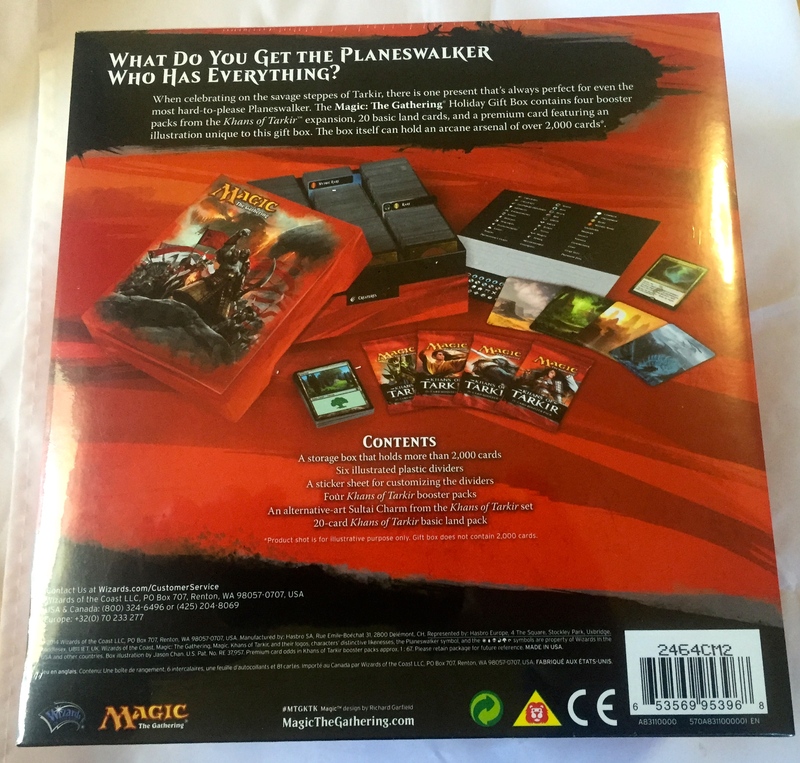 I purchased two Theros gift boxes for the SpartanKids last year. I didn’t bother reviewing them. 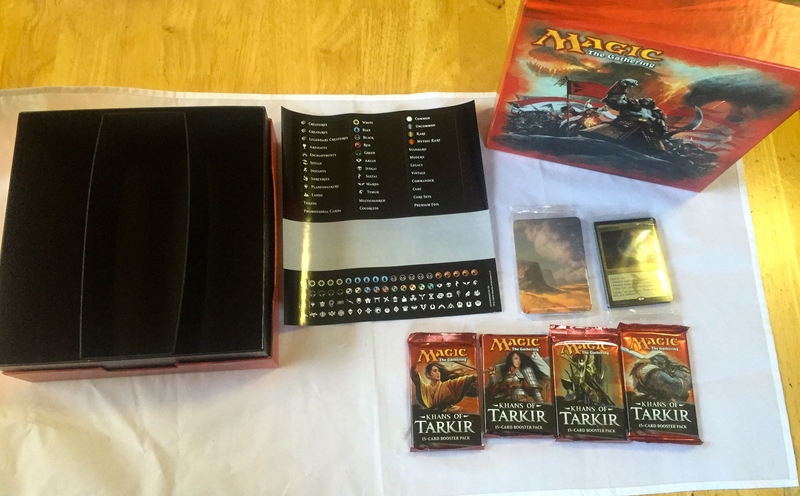 But I purchased the Kahns of Tarkir gift box for myself at Friday Night Magic on Feb 13, and thought I would share my unboxing experience with the world! The back shows what you get. What is actually going on is there is a sleeve over the actual box. Sorry. Too big a shot to keep the kitchen table from appearing! 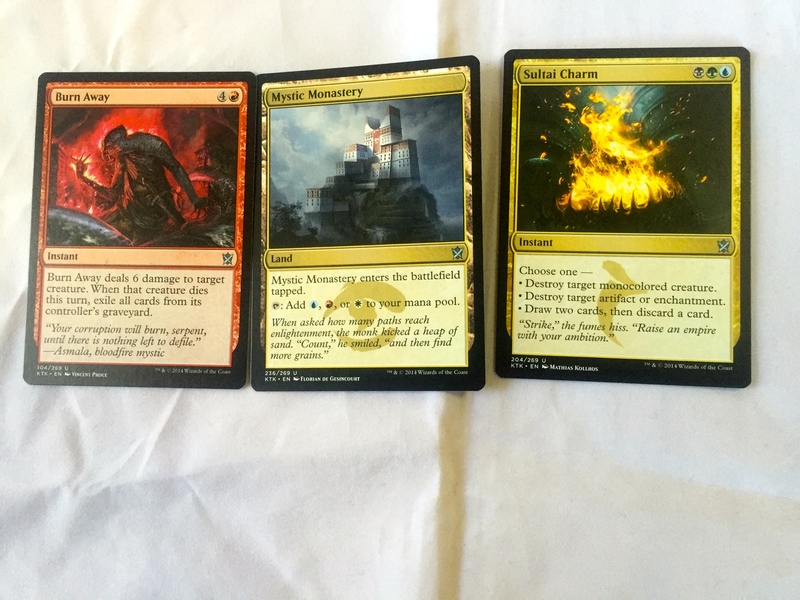 I was surprised…there was what looked like a seeded pack with a special foil on top! You got four regular packs, a pack of artsy dividers, and a label sheet. Oh yes, also a nice box with three sections. Here are the dividers where you can see them. They are really pretty! 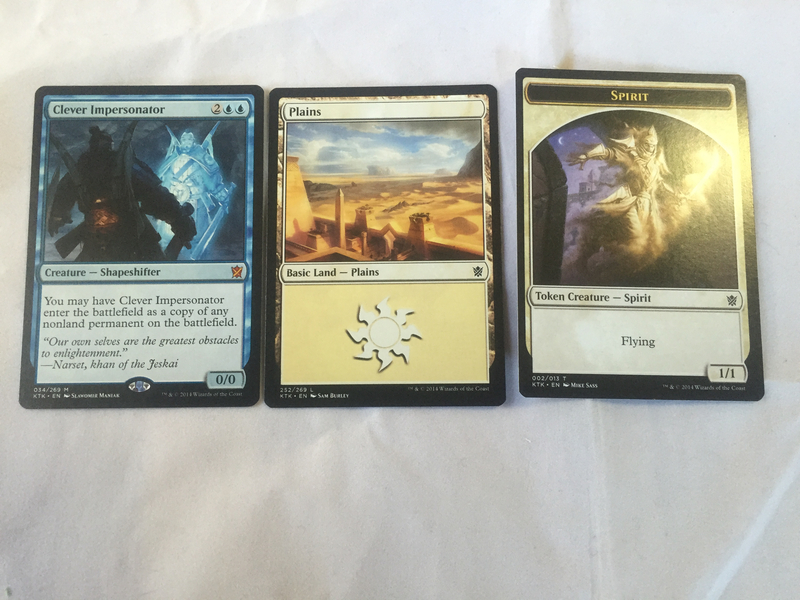 That “seeded pack” wasn’t a seeded pack after all…(sadness.) 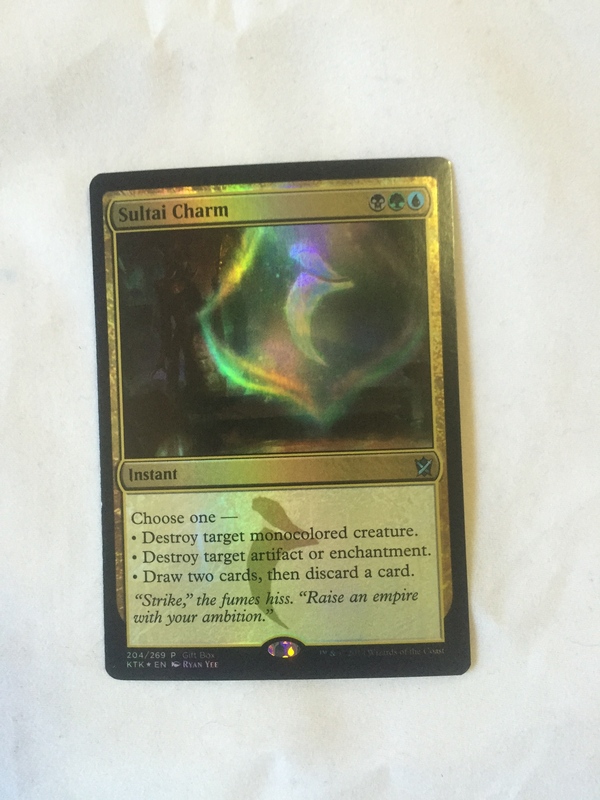 It was a pack of lands, with a premium foil Sultai Charm on top. I believe this card is exclusive to this Holiday gift set. 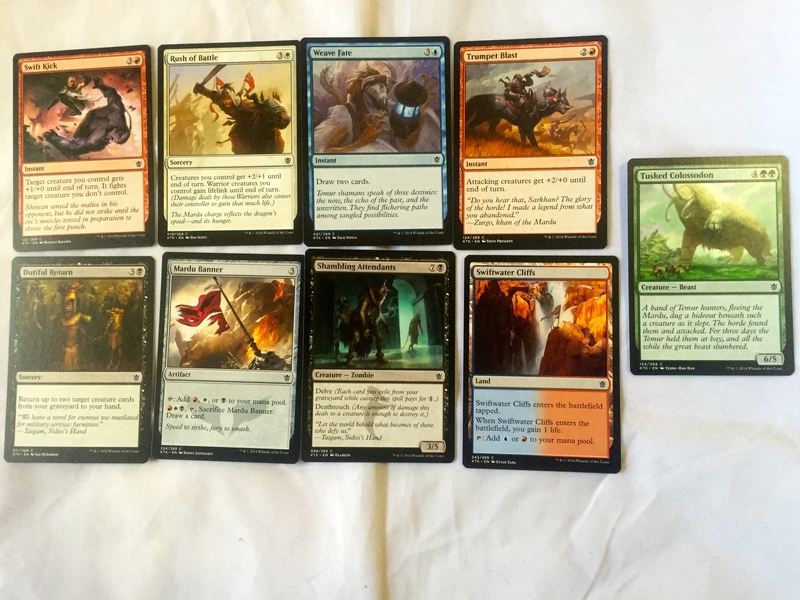 I think that is one copy of each of the basic lands printed for Kahns of Tarkir. 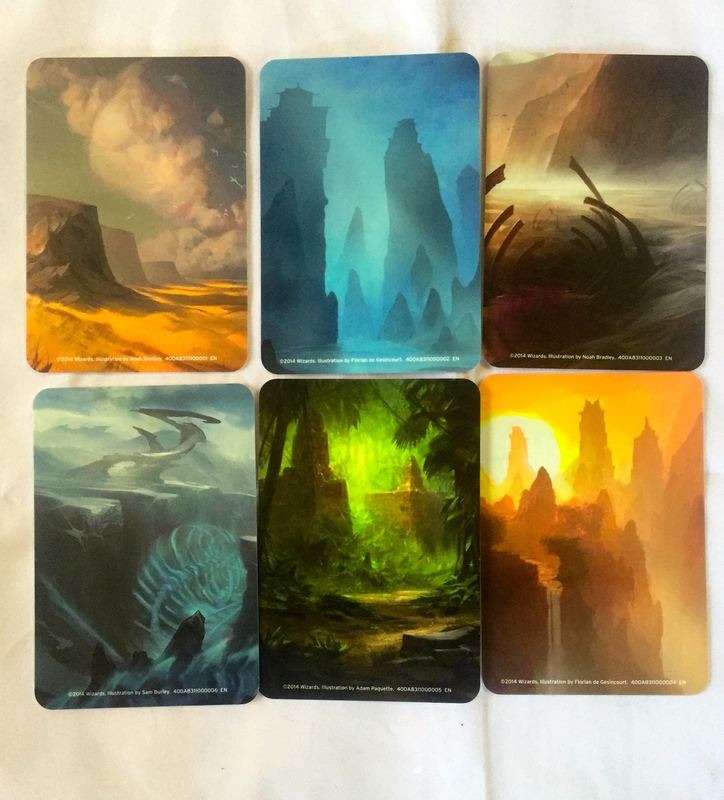 I am going to open the packs so you can see them just as I did! 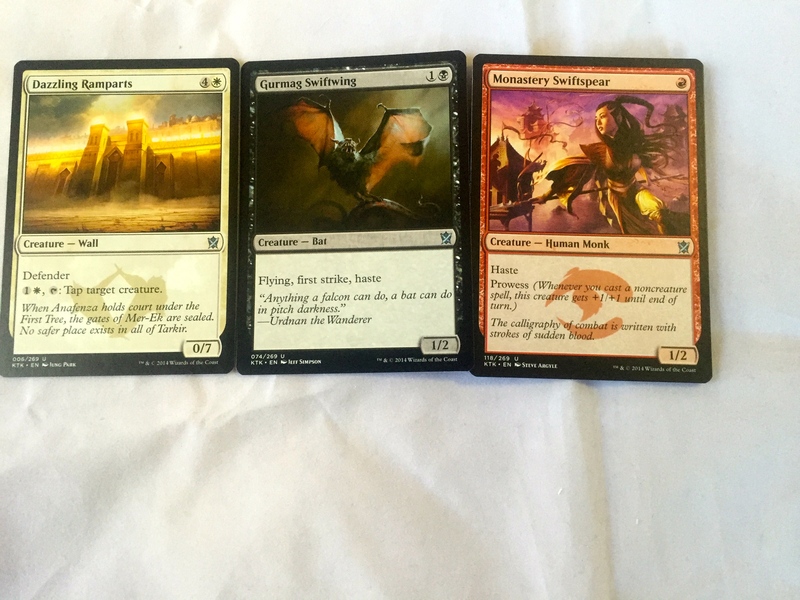 I will reveal the commons, then the uncommon, and finally the rare and extras from each pack. 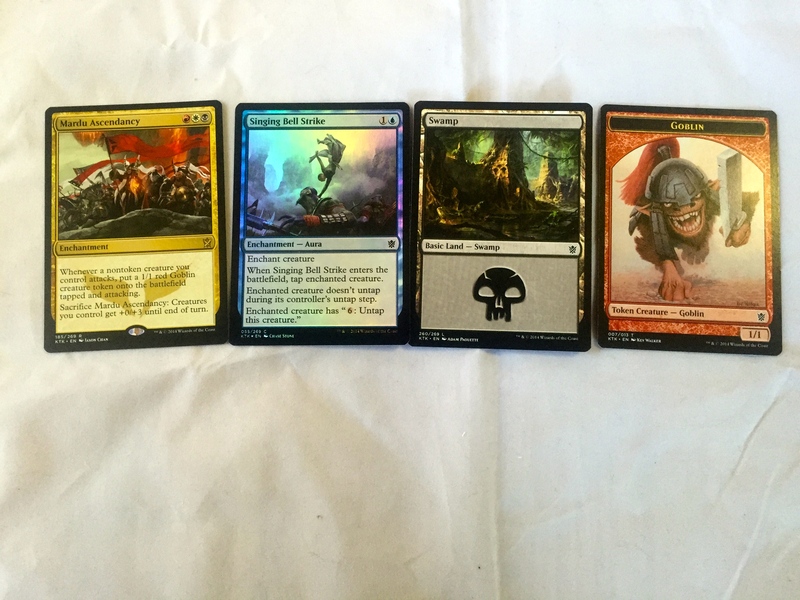 Nothing too notable in Pack 1! Clever Impersonator hasn’t seen that much play, surprisingly. I like Kin Tree Invocation. But even in the warrior deck, it hasn’t been used much. 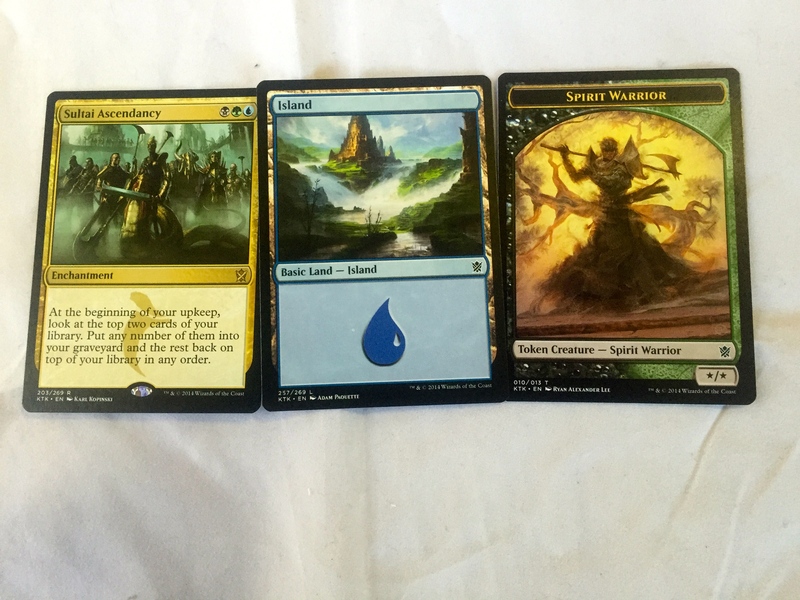 I noticed right away that there were less commons in this pack…meaning a special surprise in the back! Of the commons and uncommon, I like Gurmag Swiftwing the best. 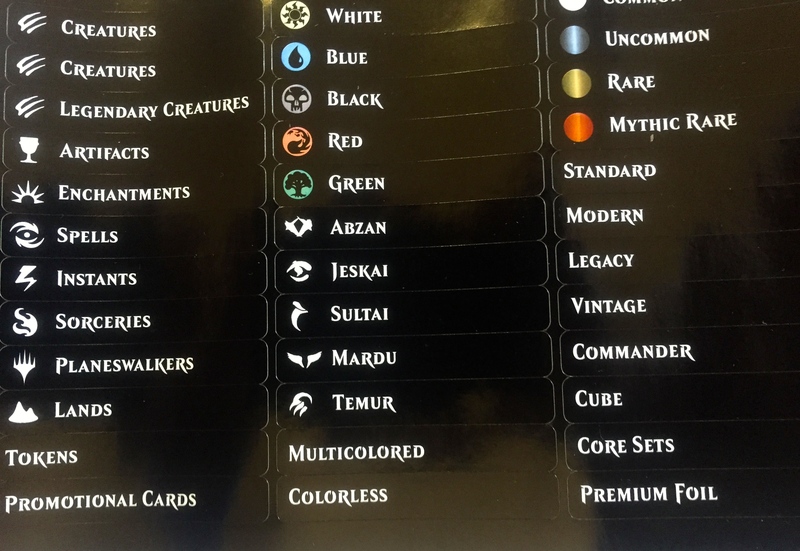 My rare was Mardu Ascendancy. What was that special card? A fetch land? No. A premium rare? no. A foil Singing Bess Strike. Really a pretty good card. But not a fetch land. Another situation like before! But no fetch. This time my rare is really good, Blood-soaked Champion. A fighter who just won’t die! Horde Ambusher was my foil card. 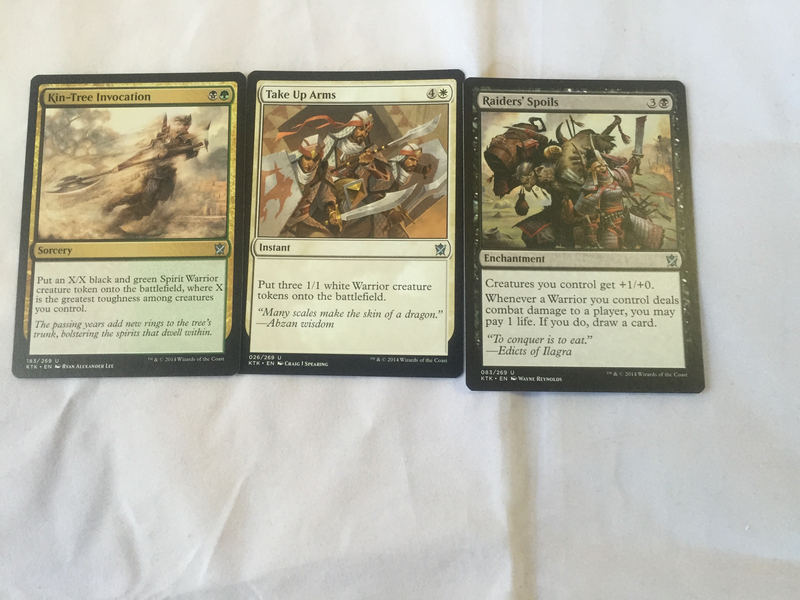 And things round out with Sultai Ascendancy. A pretty good card for Sultai decks. Packs are packs. They are always a gamble. 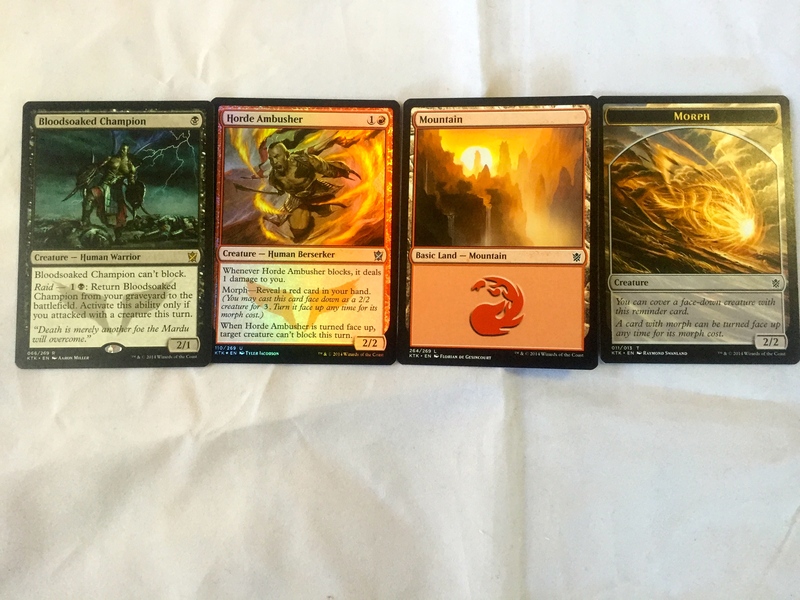 If I had purchased these four packs, I wouldn’t have been too happy. Finally, how good does the box hold cards. I stocked it up with more cards so you could see. 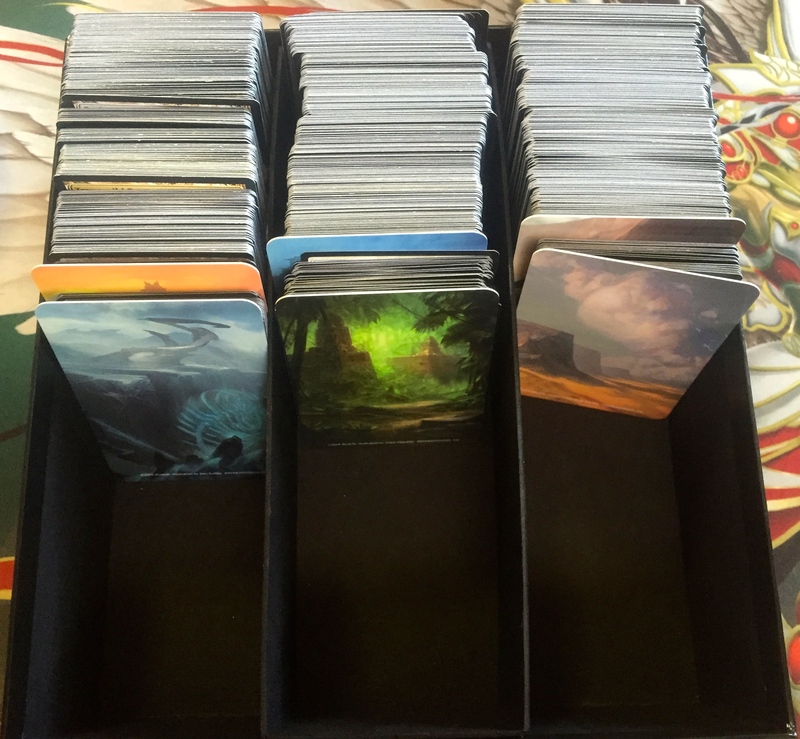 There is enough room for sleeved cards. This box has already helped me consolidate some of the odd and end boxes in my nerd closet! 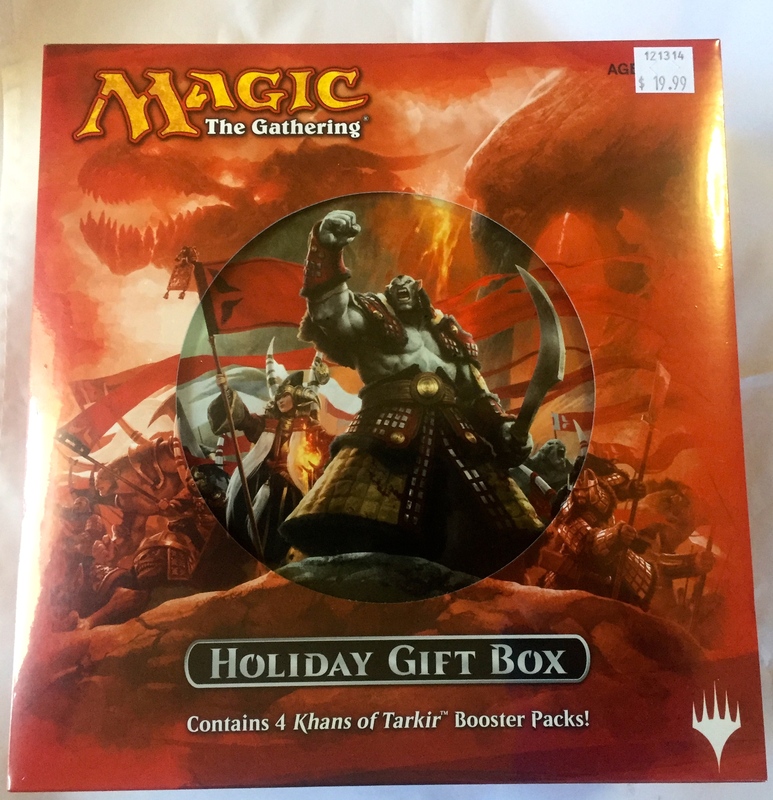 What do I rate the Kahns of Tarkir Holiday Gift Box? This is really a terrific product. 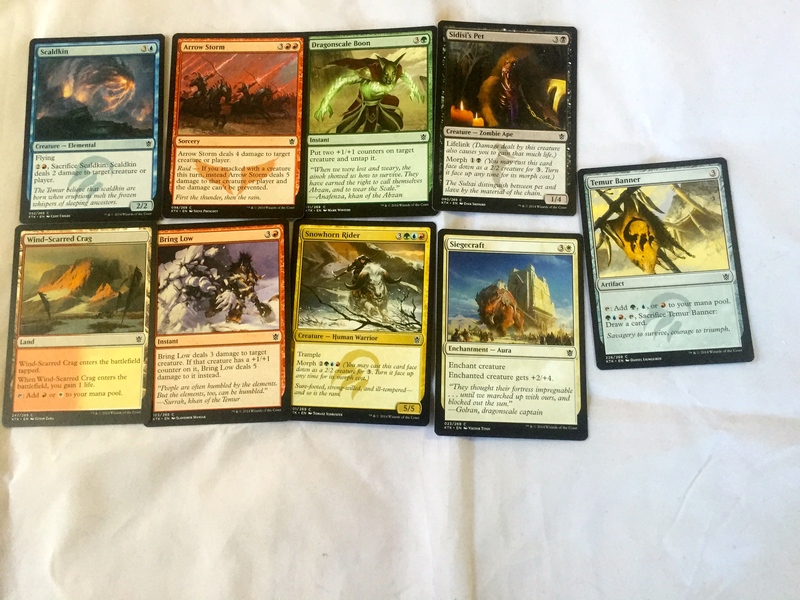 If a person did not know what to get a MTG player, then this is a pretty good gift. 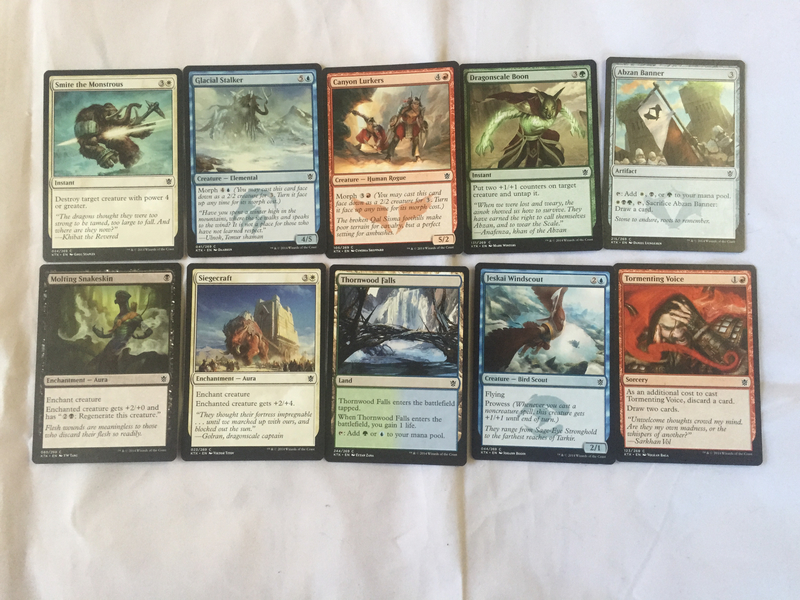 The box works good, but the packs are a gamble. The label sheet is the only thing I haven’t mentioned. Check this out! 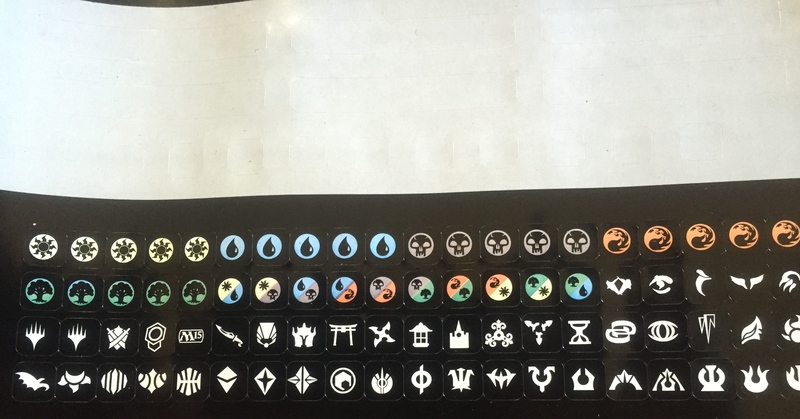 I wish there was a guide for what set each symbol represents. This is something I can’t do yet. Then there are blank labels for you to write whatever you want when organizing your cards. So I guess I will give it a 5/5. 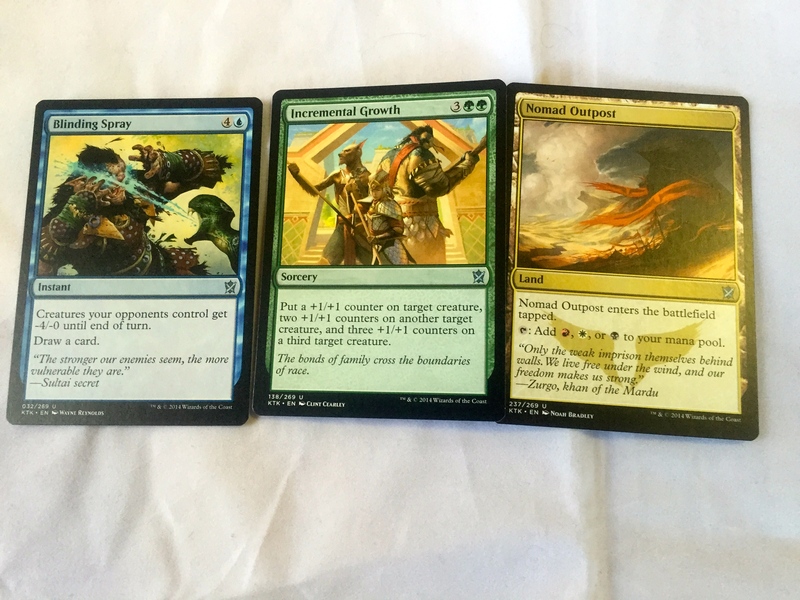 The packs are a gamble, so I easily could have gotten a Sorin and a Sarkahn. (I heard of someone opening a Holiday Box and getting these two.) But I didn’t. 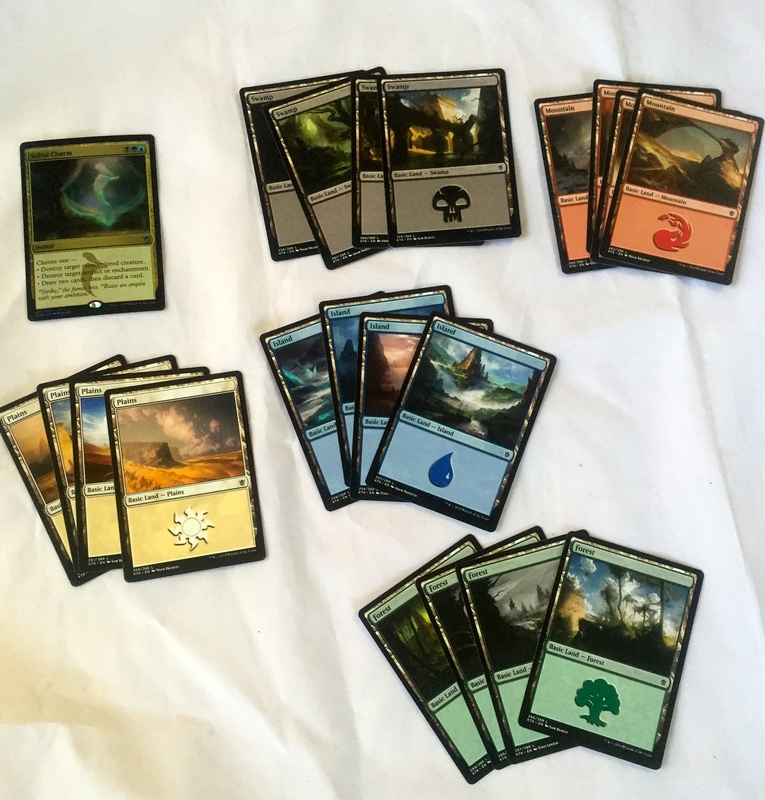 Otherwise, it is a good general product for MTG players, and a good starting product for new players, giving you four copies of the basic lands. What is your rating? Do you agree? Let me know. Even better, let me know what you opened in Your holiday box! 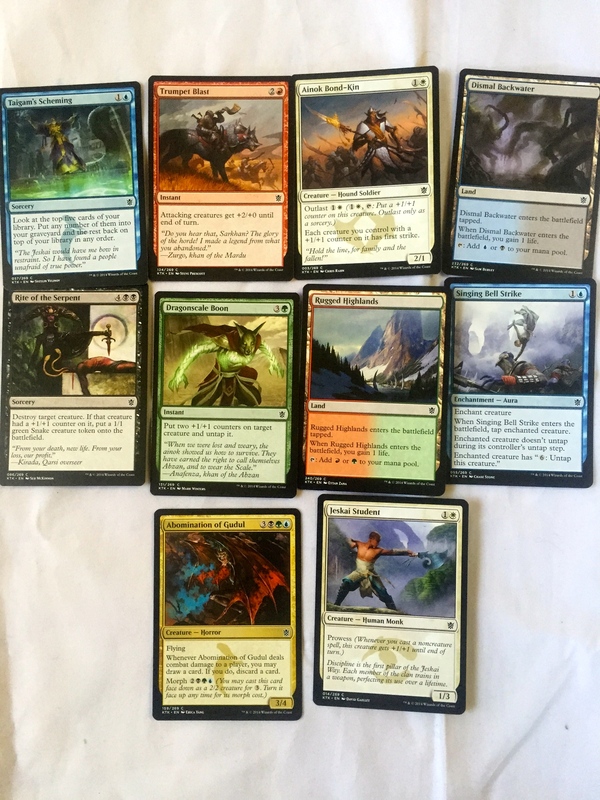 This entry was posted in Kahn of Tarkir, Magic the Gathering, SpartanNerd and tagged Kahns of Tarkir, Magic the Gathering, SpartanNerd Unboxing and Review. Bookmark the permalink.